In my previous post, I set out my plan to take Lernabit offline so I could rebuild the site with numerous improvements in mind. Today, after months of development, I'm excited to announce that the new Lernabit is live! Read on to find out what is new, and what is in store going forward. The most significant change to Lernabit is that anyone can now create Bits of their own. In version 1 of the site, only I could create Bits. But after making many of them, I began to realize just how valuable the process of actually creating Bits was to my own education. The best way to reinforce your own knowledge of a subject is to teach it to others. That part is not a new idea. But what I found out was that teaching via audio is particularly effective at strengthening your knowledge. When teaching through a format like video, you can often let yourself get away with not knowing every last detail. If you don't quite grasp something, you can just show a diagram or an image that might help the students understand, but it doesn't help you understand. Audio doesn't allow this. When all you have are words, it forces you to understand every little detail so that you can explain it without images. Realizing this, I decided that the new Lernabit would be a place not only where people could learn, but it would be a platform where they can also teach others what they know, thereby improving their own understanding of the topic. With this goal in mind, I focused a lot on creating a powerful publishing tool that would make it as easy as possible to create educational audio content. The new tool allows you to write notes on what you want to teach, save drafts to come back and work on later, and easily upload the audio file for your Bit. Once you publish it, it's immediately live on the site so others can listen to it. The second major change to the site is a pledge to donate at least 5% of all profits from the site to charities focused on education around the world. The goal of Lernabit has always been to make education more accessible. But while creating educational audio content is a major step toward making that happen, it still isn't enough. According to data released by Facebook, there are still 4 billion people around the world without Internet access. In addition, a wide range of economic, political, and social problems prevent people from obtaining the education needed to improve their economic situation and create positive change for their communities. As a for-profit venture, I believe Lernabit can be a powerful tool to help change this. 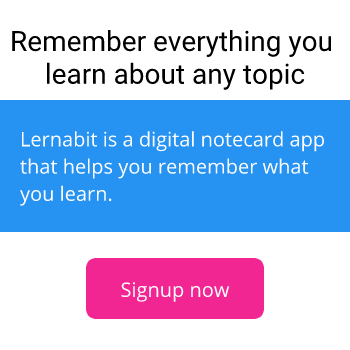 One of the cool parts about Lernabit is that the educational content is all created by you. Since it doesn't cost me anything to create that content, I can afford to give the money to some of the excellent non-profit organizations that are building schools, improving infrastructure, and improving lives through education. I believe it is important for us to realize that lack of education is not a single problem; it is a set of many problems that each need a different solution. When for-profit businesses team up with nonprofit organizations and we each attack different problems, we can create real change. So I'm proud to pledge a portion of all profits from Lernabit to help find the solutions we need. A top priority is to create a native Android app. In my last post, I said I was unsure whether or not this would be available right away. I've decided to wait before releasing that. A working version is already built, but it is still very unstable and not quite ready for prime time. However, if you are interested in being a beta tester for the app, let me know in the comments or message me on Twitter or Facebook. A rather sophisticated system of voting on Bits. But instead of just showing the most popular Bits, this would ideally show those that are of the highest quality in terms of factual accuracy. The details are still being worked out. Commenting on Bits to allow discussion and feedback. One last note: If you had an account on the old site, your old login username and password should still work. Or you can just use the "Forgot Password" tool if you don't remember your login data. I'm excited about this new site. The new features and my pledge to support nonprofits will be powerful tools to improve education around the world.